This is a great STEM challenge to do around Spring Break! Can your group build the tallest free-standing tower using plastic eggs? 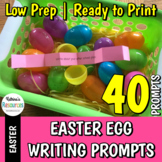 Materials: (per classroom) One bag of plastic Easter eggs per group (there is an 18 pack from the Dollar Tree) Tape measure Get those kids building towers today! Easter Science 3-D Plastic Egg Tower! 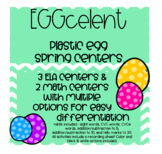 Spring into Fractions with Plastic Eggs! 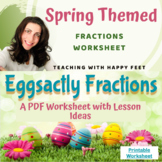 Using plastic eggs and colored candies, use this worksheet to accompany a fun and engaging fraction lesson on equivalents and ratios! Here Chickie Chickie Chick Plastic Egg Genetics! CHEEP Lab! 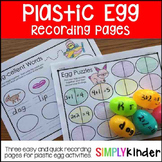 Word Family Game - using plastic eggs! 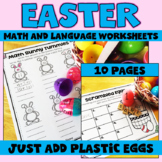 Give your students some fun practice with addition and subtraction using plastic Easter eggs! There are 6 different recording sheets for addition, subtraction, and counting! These make a great center activity. There are recording sheets included for all. Just print and add eggs!